Revelation 13:1 And the dragon stood on the sand of the seashore. Then I saw a beast coming up out of the sea, having ten horns and seven heads, and on his horns were ten diadems, and on his heads were blasphemous names. This verse contains a hint. From where does the antichrist come? What is all of this business regarding horns and heads and diadems. The Bible gives an explanation for each of these terms. But, you have to look for it. The answers are given in the Old Testament and New Testament. In the Bible, horns are equated with kings and leaders. This was the case in the writings of the Old Testament as well. Daniel’s dream in Daniel 7 is consistent with the verses in Revelation 13 and 17. The language regarding beasts and horns is consistent. Revelation 13 does provide additional information regarding “heads” which will be discussed in the next post. With Daniel’s dream, four beasts came up from the sea. Beasts are equated with kings and kingdoms (Daniel 7:17). The issue is the fourth beast. Daniel 7:7-8 After this I kept looking in the night visions, and behold, a fourth beast, dreadful and terrifying and extremely strong; and it had large iron teeth. It devoured and crushed and trampled down the remainder with its feet; and it was different from all the beasts that were before it, and it had ten horns. While I was contemplating the horns, behold, another horn, a little one, came up among them, and three of the first horns were pulled out by the roots before it; and behold, this horn possessed eyes like the eyes of a man and a mouth uttering great boasts. Daniel did not interpret the dream. He had divine help. Daniel 7:19-20 Then I desired to know the exact meaning of the fourth beast, which was different from all the others, exceedingly dreadful, with its teeth of iron and its claws of bronze, and which devoured, crushed and trampled down the remainder with its feet, and the meaning of the ten horns that were on its head and the other horn which came up, and before which three of them fell, namely, that horn which had eyes and a mouth uttering great boasts and which was larger in appearance than its associates. Daniel 7:23-24 Thus he said: ‘The fourth beast will be a fourth kingdom on the earth, which will be different from all the other kingdoms and will devour the whole earth and tread it down and crush it. As for the ten horns, out of this kingdom ten kings will arise; and another will arise after them, and he will be different from the previous ones and will subdue three kings. The beast kingdom will start out as a ten ruler committee. The antichrist, little horn, or the beast of Revelation (take your pick of names) will eliminate three of the rulers and take control. The other seven rulers will hand over their power to the antichrist. That is the sequence of the beast taking control of his empire. Revelation 17:12 The ten horns which you saw are ten kings who have not yet received a kingdom, but they receive authority as kings with the beast for one hour. Horns are equated with kings. These kings are going to turn over their authority to the beast or antichrist. Revelation 17:13 These have one purpose, and they give their power and authority to the beast. 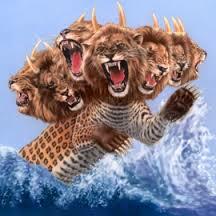 Daniel 7, Revelation 13, and Revelation 17 are the same time period, same beast/kingdom, and same beast/antichrist. Guess work is not indicated. God reveals, but His word has to be read. This entry was posted on February 1, 2015 at 9:20 AM and is filed under Antichrist/Beast, Prophecy with tags 10 nation kingdom, 7 heads, 7 horns, Antichrist, beast, Daniel 7, God, horn, little horn, Revelation 13, Revelation 17. You can follow any responses to this entry through the RSS 2.0 feed. You can leave a response, or trackback from your own site.